What’s the biggest headache with having a traditional oyster shell or decomposed granite bocce ball court surface? It’s the extremely high level of maintenance required to prep the court before play. Every single time, you are suppose to rake, broom, wet and roll your organic surface. It’s kind of like a Japanese Garden, without all the zen and feng shui. AllSport America installs custom, low-maintenance, backyard outdoor bocce ball courts. We install courts with proprietary surfaces that don’t require all the cumbersome maintenance. 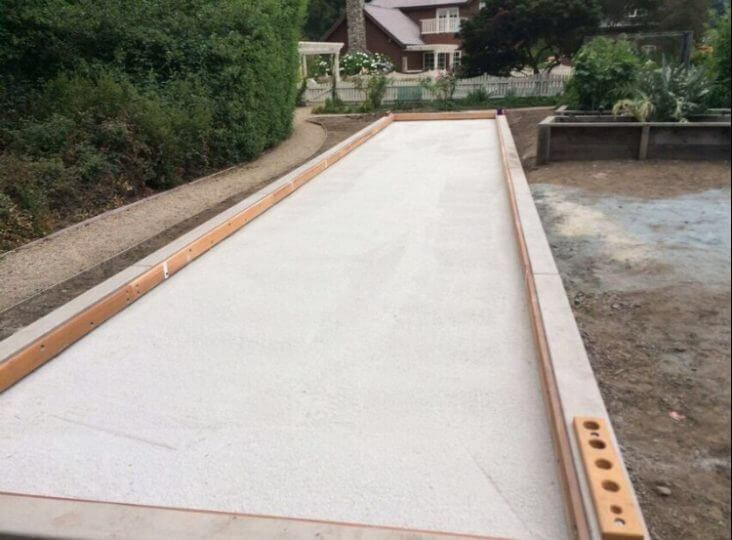 Bocce Builders of America (an AllSport America company), has created the Pacific Pearl bocce surface system. With Pacific Pearl, there is no more raking, brooming, wetting and rolling. Every time you want to play, you simply step outside (or inside if you’re fancy) and the court is ready for entertainment and play. All you have to worry about is pouring the next glass of Napa’s finest cabernet and perfecting that bocce roll of yours. 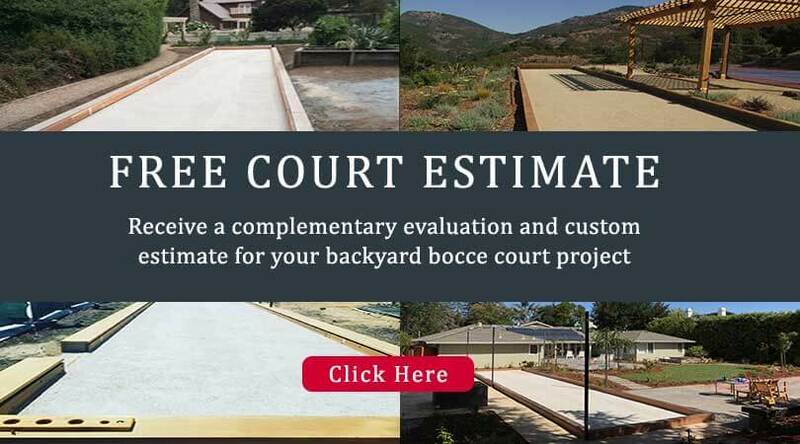 Once you make a selection on the border type and we complete installing the French drain, the French drain and resilient base layers are placed, we then install the Pacific Pearl bocce surface system. Our proprietary tan fibered base layer is a custom fibrillated weather treated poly fiber with a combination dual poly fabric and urethane backing custom perforated for correct drainage. The spacing of these fibers is critical to the “locking” function of the system which allows for continued play without raking, rolling, hydrating or brooming. We manufacture the fibers in 12’ widths to accommodate most bocce ball court dimensions (custom wider widths are available). Unlike the green, synthetic lawn products used for synthetic lawns and have various fiber structures which collapse over time, the Pacific Pearl Bocce Surface duplicates and even improves ball roll, ball deadness without looking like a plastic lawn. We make sure you get at least a 97% relax value on the product before installing the mid layer materials. The top oyster blend surface further gives this system its Old World look. The play is unparalleled in the sport of bocce ball. Once we install the synthetic fibered layer, the next step is to place the mid sub-angular cushioned layer specifically designed to lock the system together and virtually eliminate ball roll marks, dents, divots or other “tracers” that reduce the ability to roll the ball with any consistency. Of course all bocce courts built will have subtle movements from hand spin, various slopes or small elevation changes but you don’t want your bocce ball to be rolling in the last player’s roll line….the bocce gods would frown from above! Once placed evenly throughout the bocce court, this material must be power-broomed in place to lock it into the synthetic fibers. Sometimes we add additional material before the final playing surface is installed. After we install the mid-layer and it’s compacted and power broomed into place, the final 3/8” of our special oyster flour, crushed carpenter oyster blend is applied evenly across the surface. It is critical to make sure each layer of this system is installed level and consistent starting with the underlying base materials. If you’d like to read up on the official rules of Bocce, you can visit this website. San Jose, San Francisco, Sacramento, Reno, Fresno, Sonoma, Peninsula Regions, and the entire Bay Area.